Steve Roberts is a long running supporter of the Events of the North having completed in the sister events in Sunderland since the inaugural event in 2011. 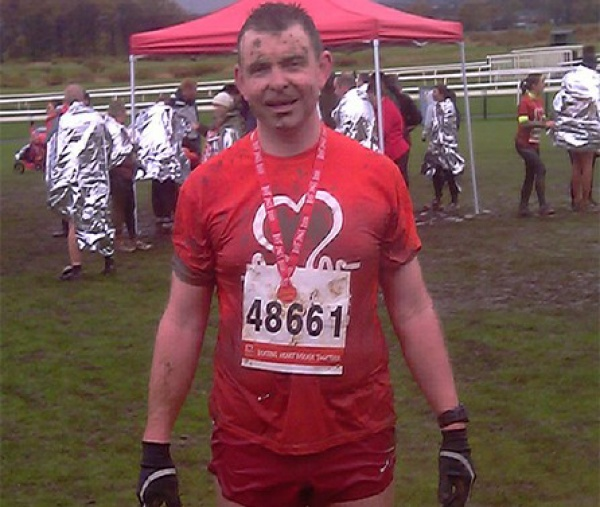 We caught up with him to hear his inspirational story as he prepares for this year's Kielder 10K, raising money for the British Heart Foundation. When did you take up running? I’ve always enjoyed to run. I even chose to do cross-country running at school instead of playing football! Unfortunately, I let the running fall by the wayside during my 20’s and 30’s. When I turned 40 I took a look at my ‘figure’ and was less than impressed with how I looked, so, mindful of my medical history, I decided that I’d better get into running again – still recreational, just to lose weight. When did you start running the events in fancy dress? The day I started running in fancy dress was the day that TheBigRedHeart was born – 19th September 2010. It happened quite by chance – but I experienced a life-changing moment during that run (it was the Great North Run) – and I knew then, in that moment, that fancy dress was my calling, what I was meant to do. How much have you raised to date for the British Heart Foundation? I don’t know exactly how much I’ve raised for the British Heart Foundation but it’s approximately £1100. It’s not a lot because I believe that charity should be just that – charity. People should give because they want to give, and not because you’re shaking a tin in their face. I endeavour to increase the numbers of Facebook fans and Twitter followers I have, in the hope that corporate sponsor(s) may come along. Firstly, a few years ago my Dad fell ill and it was discovered (just in time – it was estimated that he had just 6 weeks to live) that he required a triple heart bypass. The operation was a success and he is still with us to this day. He and my Mam often accompany me to my running events sporting their BHF supporter T-shirts. I now look back and realise, regrettably, that I have let that statement alter the course of my life. I have not lived my life to its fullest because I know I have no future. Because of ‘that moment’ in 2010 I decided to create TheBigRedHeart and use my love for recreational running to help others while I still have time. My legacy will be that I’ve helped to save the lives of others with heart-related disorders … and help the BHF realise their vision that they will be able to cure heart disease within the next few years. That way, they can be there for me when I need them the most. In April I’ll be 45 (22 years I’ve been on the medication) – how much longer do I have? Tell us why you have decided to run the Kielder 10K for the first time this year. In 2012 I ran in the Kielder Marathon. I began to struggle after 20 miles, and continued to struggle more and more despite the fact that I was now only walking. At 24 miles the mountain rescue volunteers stopped me and told me that they couldn’t let me continue. I had stage 2 hypothermia. I spent the next 2½ hours in an ambulance – the ambulance crew finally deciding that I’d recovered enough for them to discharge me from their care. By this time the race had ended and the free bus service had stopped running. The Events Of The North team very kindly arranged for one of their minibuses to transport me to the accommodation where I was staying. To this day, I am eternally grateful to the mountain rescue team, the north-east ambulance service, and the Events Of The North team for looking after me and for saving me from myself. Will and human desire are very useful tools to have in a runners kit bag – but I realise now that if I’d continued on I wouldn’t have made it to the finish and my fate would have been a lot worse. This remains the only ‘did not finish’ I have ever experienced. I don’t ever keep my running numbers – but that one (2406) is on my bedroom wall. Every time I awake it is a reminder to myself that I need to avenge that defeat – but also to be mindful of ones limitations, ‘there’ll always be a next time’. I entered again last year but decided not to run because of an injury (lesson learned). I have been injured again recently – so I decided not to enter the marathon, but to enter the 10k instead. This seems poetic because it means that I will finally get to see the only part of the marathon course that escaped me in 2012 – those last 2.2 miles! You are famous for your fancy dress running costumes, and Kielder will be no different as you will be appearing as Kermit the Frog...why Kermit? !